According to the press release, both expansions will offer “new challenges, puzzles, items and enemies,” with the goal of unlocking new armour and weapons for player character Fury. In The Crucible, Fury is offered the chance to “test her skills in battle”, so she’s invited to the titular arena to “fight wave after wave of enemies, competing for a chance to unlock new rewards and items.” Certainly sounds like a Horde mode to us. Keepers of the Void, on the other, seems far more in-keeping with the Zelda-style nature of the Darksiders series, as it will send Fury to a new dungeon location called the Serpent Holes. These rather disgusting-sounded areas “are riddled with new puzzles and enemies eager to test Fury’s abilities.” Players will be able to unlock a new weapon and the Abyssal Armour set. We consider Darksiders II to be one of the best action-adventures on PC, so there’s certainly a weight of expectation on the shoulders of Darksiders III – especially after a six-year wait between games. We’ve played a chunk of it already, and you can see it in action right here. Both of the DLC expansions will follow the game’s release on November 27. There’s no word yet on an exact release date for the DLC, nor how much they will cost. 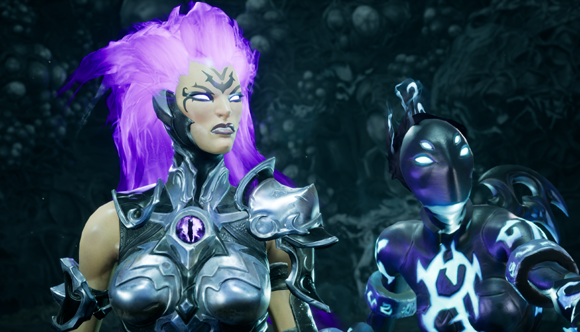 Both The Crucible and Keepers of the Void will be available with the Deluxe Edition of Darksiders III.